Located around 50 kilometers from Bhopal, the Rock Shelters of Bhimbetka is a collection of 600 caves that bear rock paintings belonging to the Neolithic Age (around 10,000 BC!). See the brilliance of the dyes used, the pictographs that tell the story of human history and the old caves that add to its historic appeal. A walk here is fascinating for history lovers and gives you a peak into one of the most rare archeological findings in not just India, but in the world! Cave paintings of inducing bison, tiger, rhinoceros, wild boar, elephants, monkeys, antelopes, lizards, peacocks. Rituals and chores depicted in the paintings that speak of the daily life during those times. INR 10 per person for Indians. INR 100 per person for foreign tourists. INR 50 per LMV for Indians. INR 20 per LMV for foreign tourists. INR 100 per mini bus for Indians. INR 400 per mini bus for foreign tourists. By Train: At ObaidullaGanj Railway Station. 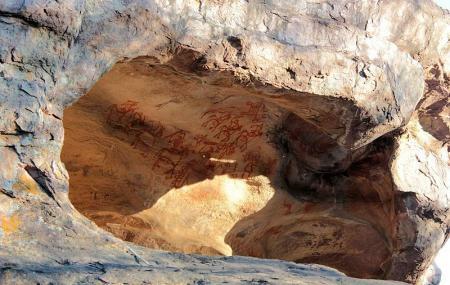 How popular is Bhimbetka Rock Shelters? People normally club together Ratapani Wildlife Sanctuary and Lakshmi Narayan Temple while planning their visit to Bhimbetka Rock Shelters. People also prefer to start their day with Bhimbetka Rock Shelters.